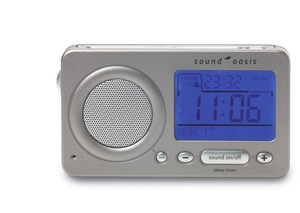 Sound Oasis travel sleep machine is a unique sound therapy product that combines high performance digital sounds with a full-featured travel/alarm clock. It incorporates 18 digitally recorded sounds, an exclusive jet-lag reduction sound and a voice memo feature. Timer with 4 positions: continuous play auto, 30 min., 60 min. and 90 min.